The hotel is located in the heart of De Waterkant, Cape Town, tucked below the historical Bo Kaap and close to the bustling V&A Waterfront, having re-established itself as the latest and trendiest hot spot, not only in its continual extending variety of stylish retail stores, restaurants, coffee bars and nightspots, but also in the new trend of upmarket and contemporary holiday destinations. The hotel is 20 km away from Cape Town International Airport.||Inspired by the early 1900 buildings of Downtown Manhattan, the hotel displays an inherent richness and warmth. It has been designed to have an upmarket, industrial New York feel. Textured raw rock, brick and plaster are set against smooth glass and tempered steel. This incorporation of the more sophisticated elements to the more traditional designs gives the hotel a contemporary feel and a style all its own. Guests of this city hotel are welcomed in the lobby with lift access to the upper floors. 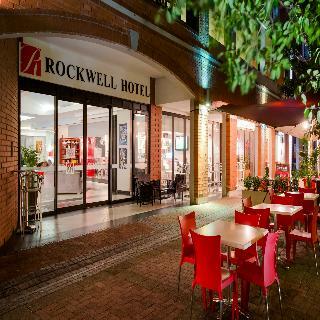 Facilities include air conditioning, a café, restaurant, conference facilities, wireless Internet access and room service.||The hotel offers en suite rooms and apartments with views of Signal Hill, Table Mountain, Cape Town Harbour or Green Point. All the rooms are equipped with tea and coffee making facilities, electronic safes, selected satellite channels, 60MB free Internet daily and hairdryers. All are en suite with a shower and a bath. Further in-room amenities include a double bed, individually regulated air conditioning and a balcony or terrace.||Guests are invited to take a dip in the heated swimming pool.||An in-house restaurant serving a variety of delectable meals for breakfast, lunch and dinner is available. For guests' convenience, the hotel's room service menu is available daily until 10 pm. Lunch and dinner are available à la carte.